Thank you for using Slicing Pie (SlicingPie.com, ThePieSlicer.com) from Fair and Square Ventures, LLC. By using our sites, you agree to our Terms of Service, which is a legal agreement. If you are using these sites for an organization, you are agreeing on behalf of that organization. Information contained on or made available through the site or in any forms is not intended to and does not constitute legal advice, recommendations or counseling. Your use of this form does not create an attorney-client relationship. We do not warrant or guarantee the accurateness, completeness, adequacy or currency of the information contained in or linked to the form and your use of the form is entirely at your own risk. You should not attempt to issue securities or use this form without seeking the advice of a competent attorney licensed to practice in your jurisdiction for your particular problem. All documents are provided on a non-exclusive license basis only for your personal one-time use for non-commercial purposes, without any right to re-license, sublicense, distribute, assign or transfer such license. Documents are provided without any representations or warranties, express or implied, as to their suitability, legal effect, completeness, currentness, accuracy, and/or appropriateness. THE DOCUMENTS ARE PROVIDED “AS IS”, “AS AVAILABLE”, AND WITH “ALL FAULTS”, AND WE AND ANY PROVIDER OF THE DOCUMENTS DISCLAIM ANY WARRANTIES, INCLUDING BUT NOT LIMITED TO THE WARRANTIES OF MERCHANTABILITY AND FITNESS FOR A PARTICULAR PURPOSE. The documents may be inappropriate for your particular circumstances. Furthermore, state laws may require different or additional provisions to ensure the desired result. You should consult with legal counsel to determine the appropriate legal or business documents necessary for your particular transactions, as the documents are only samples and may not be applicable to a particular situation. Our Terms of Service apply to your use of our Websites and Services. 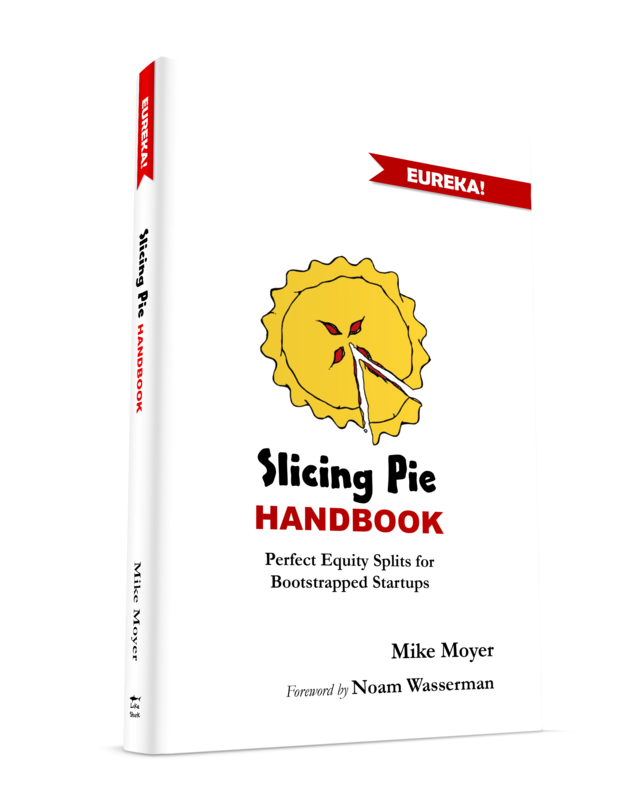 When we say, “we,” “our,” or “us,” we’re referring to Slicing Pie, owned by Fair and Square Ventures LLC, an Illinois limited liability company, our employees, directors, officers, affiliates, and subsidiaries. When we say “you” or “your,” we are referring to the person or entity that’s registered with us to use our Services. When we say “Websites,” we mean our websites located at SlicingPie.com, SlicingPie.com/PieSlicer, GruntFunds.com, including all subdomains and sites associated with those domains, and other websites that we operate now and in the future. When we say “Services,” we mean our Websites, applications, our content, and various third-party services. When we say “Slicing Pie,” we mean our Websites and Services collectively. You will not use Slicing Pie to upload, transmit, or otherwise distribute any objectionable content, as solely determined by us. As long as you comply with our Terms of Service, we grant you a non-exclusive, non-transferable, limited privilege to use Slicing Pie. Your use of Slicing Pie is at your own risk. We do not guarantee the accuracy of our reports or information. We are not responsible for disputes that arise between companies, employees or partners that may arise from our services. We own Slicing Pie and our Services. You may not copy, reproduce, alter, modify, resell, mirror, or create derivative works of Slicing Pie, our Services, or our content on Slicing Pie without our written permission. You shall grant to us a royalty-free, worldwide, transferable, sub-licensable, irrevocable and perpetual license to incorporate into Slicing Pie or otherwise use any suggestions, enhancement requests, recommendations or other feedback that we receive from you or your agents. The free trial offer entitles new, registered users free trial of the Services. Your credit card or PayPal account will be charged at the end of the free trial period unless you cancel Services before the end of the free trial period. All fees are exclusive of all taxes or duties imposed by governing authorities. You are solely responsible for payment of all such taxes or duties. Monthly Plan: A valid credit card is required for you to continue using the Services on a month-to-month basis after the free trial period ends. The Services are billed in advance on a monthly basis and is non-refundable. There will be no refunds or credits for partial months, for account upgrades or downgrades, or for months unused with an open account. Annual Plan: Payment in advance is required to continue using the Services on an annual basis after the free trial period ends. The Services are billed in advance on a yearly basis. Refunds for deleted accounts may be requested for unused months between the date of account cancellation and the final date noted on the invoice issued by us. We reserve the right to change service fees upon thirty (30) days notice. Such notice may be provided at any time by posting the changes to SlicingPie.com or by email. You are solely responsible for the proper cancellation of your account. You may cancel your account at any time by going to Pie Settings and closing your account. An email or phone request to cancel your account is not considered cancellation. You will not be charged after cancellation. There is no cancellation fee. You agree to indemnify and hold us harmless from any and all demands, loss, liability, claims or expenses (including attorneys’ fees) made against us by any third party due to or arising out of or in connection with your use of Slicing Pie. To the maximum extent permitted by law, we provide Slicing Pie on an “as is” and “as available” basis, which means we don’t provide warranties of any kind, either express or implied, including, but not limited to, warranties of merchantability and fitness for a particular purpose and to any warranties that (i) Slicing Pie will meet your specific requirements, (ii) Slicing Pie will be uninterrupted, timely, secure, or error-free, (iii) the results that may be obtained from the use of Slicing Pie will be accurate or reliable, (iv) the quality of any products, services, information, or other material purchased or obtained by you through Slicing Pie will meet your expectations, and (v) any errors in Slicing Pie will be corrected. We disclaim any and all liability for the acts, omissions, and conduct of any third parties related to your use of Slicing Pie and any linked sites and services. Your sole remedy against us for dissatisfaction with Slicing Pie is to stop using Slicing Pie. This limitation of relief is a part of the bargain between you and us. The preceding disclaimer applies to any damages, liability, or injuries whether for breach of contract, tort, negligence or any other cause of action. These Terms and all documents incorporated into these Terms by reference constitute the entire agreement between you and us and govern your use of Harvest, superseding any prior agreements between you and us (including, but not limited to, any prior versions of the Terms of Service). We reserve the right, at our sole discretion, to change, modify, add, or remove portions of the Terms, at any time. Amendments or changes to these Terms won’t be effective until we post revised Terms on the Website. Unless explicitly stated otherwise, any new features that augment or enhance Slicing Pie shall be subject to the Terms. It is your responsibility to check the Terms periodically for changes. Your continued use of Slicing Pie following the posting of changes will mean that you accept and agree to the changes. We reserve the right to do any of the following, at any time, without notice to you: (1) to modify, suspend or terminate operation of or access to Slicing Pie, or any portion of Slicing Pie for any reason; (2) to modify or change Slicing Pie, or any portion of Slicing Pie, and any applicable policies or terms; and (3) to interrupt the operation of Slicing Pie, or any portion of Slicing Pie, as necessary to perform routine or non-routine maintenance, error correction, or other changes.